This FREE handout explains a fresh approach to Sustained Silent Reading (S.S.R.) procedures to your students. As you’ll see, I use “book talks” with my students instead of traditional book reports, posters, or speech presentations. The SSR book talk is just an informal conversation with the student to determine whether the student actually read the book. Tips for this are included in the PDF download, along with student handouts and a tally sheet to help keep your records organized. It’s awesome not to have a stack of book reports to grade at the end of each term, but my favorite part of this assignment is the one-on-one time it allows me to spend with each student. Even if the book talk is only two or three minutes, I find it helps to build connections with kids (most of my classes have 35-36 students) that I wouldn’t otherwise have time to make. Give it a try for one quarter and see how it works for you. Less to grade. More fun for all. Teens really respond well to not having to build yet-another poster board or collage. Some years, they’ve actually cheered when I introduced the assignment. The file includes two different handouts, appropriate for different reading-skill levels, in two different design styles – a clean-lined modern look and a grungy urban look. Choose the one that’s right for you! 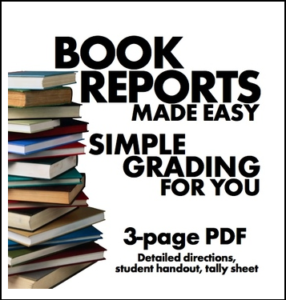 Want 10 other creative ways to assess students’ reading of their independent SSR books? Check out this budget-priced 10-pack of literary supplement handouts that can be used in a variety of ways, including alternative assessment.